Thinking of lunch box snacks isn’t as easy as it sounds. You have to balance what your child will eat, with what they should be eating. Then the school has some rules about what you’re not allowed to include too. Then there is the monotony of getting requests for the same foods that then only get half eaten. 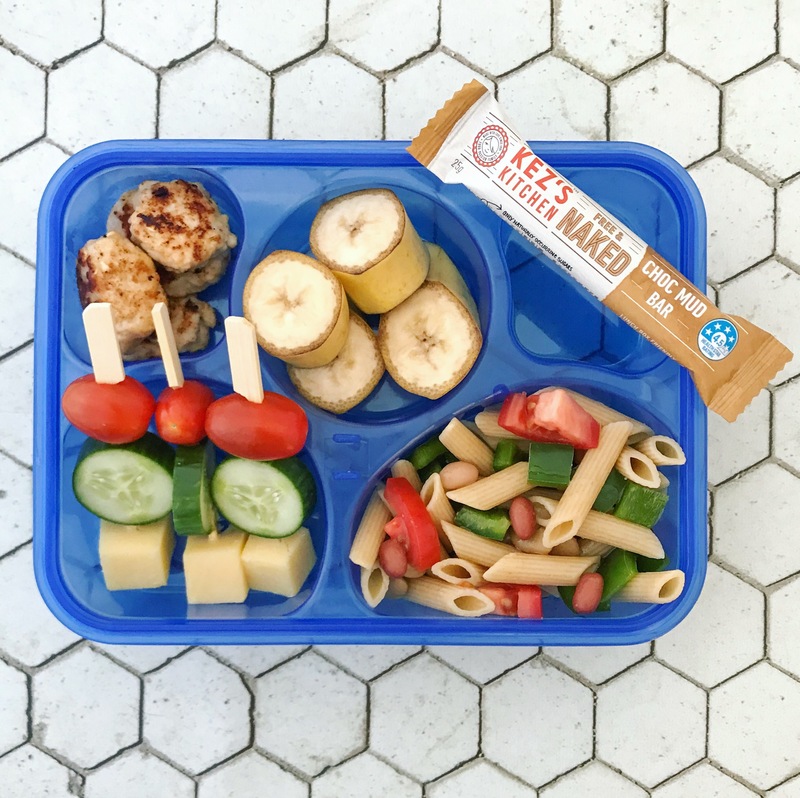 It’s no wonder healthy lunchbox snacks are the single most requested ideas on my social media! Ideally a lunchbox should contain about a third of their food for the day, with a little from each of the core food groups. That means some fruit, vegetables, dairy, protein and grains. Of course, a clean and cool bottle of water too. You can use this guide to see how much your child ‘should’ be eating in a day if you’re lost on quantities. Do remember though, that every child is different. Some eat more food when they’re at home and not distracted so will prefer a small bento style packed lunch. Others don’t eat much for breakfast during hurried mornings so will need a more substantial morning tea and lunch to get them through the day. I know you know that homemade foods full of fruits, vegetables and wholegrains are the best. I also know that sometimes we don’t have time to cook from scratch. Sometimes it’s just nice for a change to have something that comes in a packet. 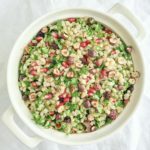 I’ve found my top picks for healthy packaged lunch box snacks. None of these products are sponsored and I am not associated with this products in anyway. 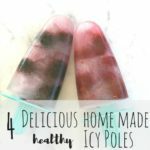 These certainly aren’t the cheapest options (it’s better to make your own) but they are healthy and get my tick of approval. 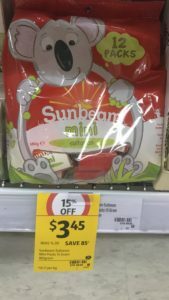 These foods can be found in most Coles and Woolworths supermarkets in Western Australia, so you should be able to find them near you. Check the brand’s website for stockists before you shop, just in case. If you want some full lunchbox ideas and recipes, checkout the series I’ve done this week over at Vicinity Shopping Centres on Instagram follow them to see the rest of the lunchboxes! 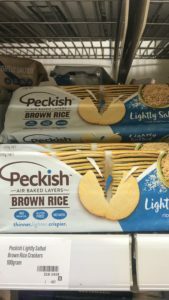 Pekish Brown Rice Crackers come in no added salt and lightly salted. Both are low salt crackers made with minimal ingredients from brown rice flour. Perfect for dipping into hommus, tzatziki or gaucamole. Vita Weats and Ryvitas (not pictured $2.85) are wholgrain crackers that add variety to the lunchbox. Give the sandwiches a break with these to go with tuna, cheese, tomato and avocado (to be assembled later so they don’t get soggy). 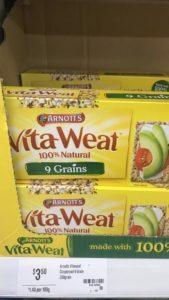 The Cracker and Cracker Chip versions of vita-weats aren’t as good though, so avoid them. Popcorn is so expensive to buy and very salty! Even the air popped stuff still has oil added to make the salt stick. Making your own is so easy. A bag of this will last you a few weeks if you’re having it every day. 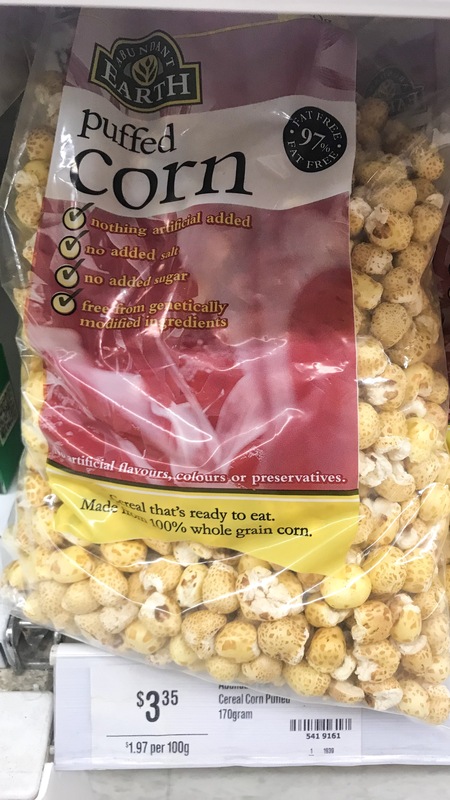 Just add a tablespoon of kernels to a brown paper bag, fol over the top edge and microwave for 2 minutes or until the popping stops. Couldn’t be easier and no washing up! 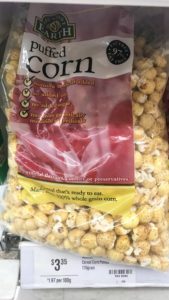 Make sure you remove the popped corn into another bag or container as any unpopped kernels in the bottom could be dangerous. 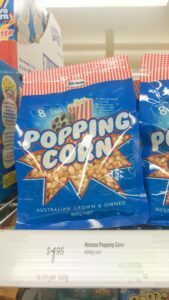 Puffed corn isn’t exciting enough to win you any favourite mum awards but it is a different take on popcorn for adding some variety. It counts as a wholegrain and provides some much needed carbohydrates for busy kids. 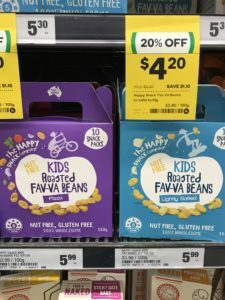 The Happy Snack Co roasted beans and chickpeas are such a great snack! All Australian’s could do with getting more legumes into their diets and these make it easy. Their range includes roasted fava beans (broad beans) and chickpeas with flavours that are low in salt with no nasties. Kids love the colourful individual packets too. Yoghurt is a great addition to the lunch box. Ignore the idea of ‘kids yoghurts’. 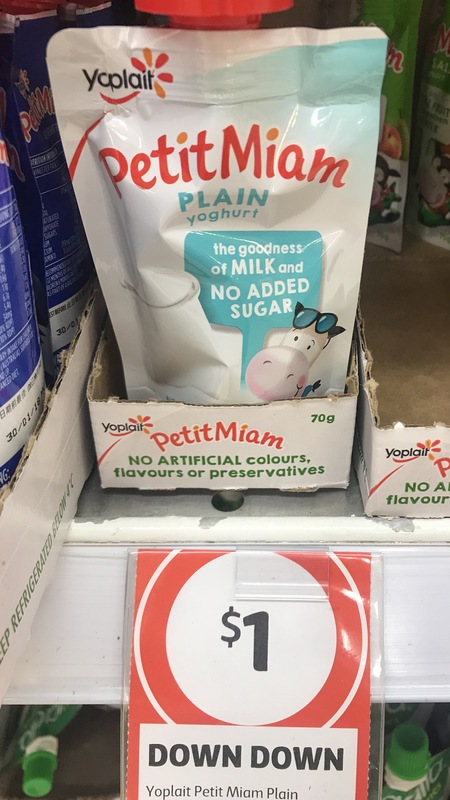 There is no need for them to have their own yoghurt and the only difference is the use of characters on the packs and added sugars to make them sweeter. 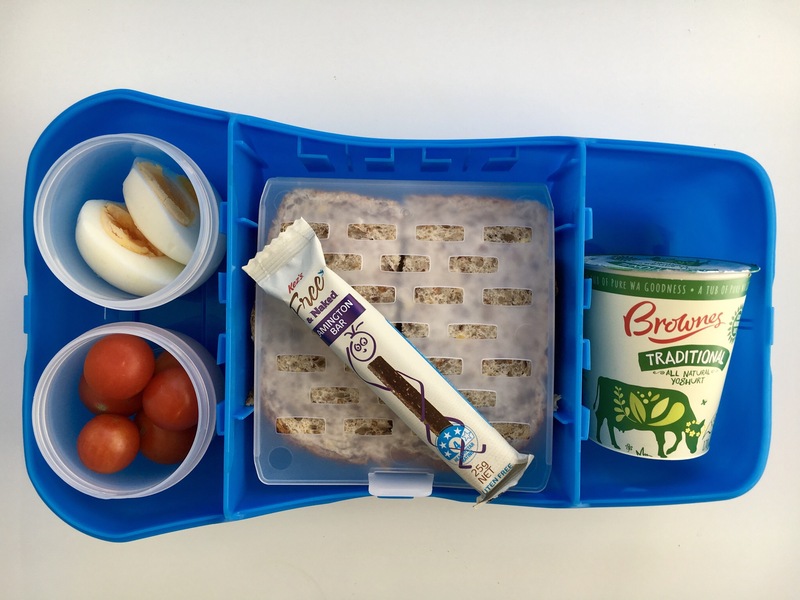 The cheapest and easiest way to serve yoghurt in the lunchbox is to take some from the family tub of plain natural yoghurt. Put it in a small container either plain or with grated apple and pear, frozen berries or chopped canned fruit to sweeten it. You may have some different options to the option I have found where you live depending on the local dairy companies (I’m in Perth, WA). 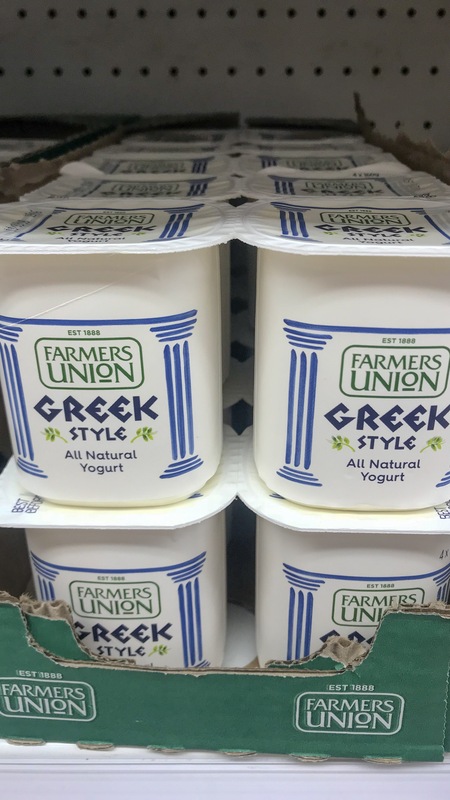 Look for yoghurt with only a few ingredients, usually milk, milk solids and live cultures, and no added sugars or sweeteners. For single serves, small pots are being taken over by pouches that are supposed to be less messy. 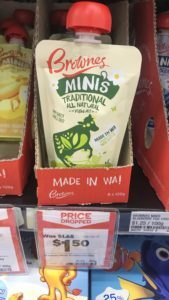 Brownes Dairy still do the single serve 170g pots in Natural – which is my pick of the single serve tubs. 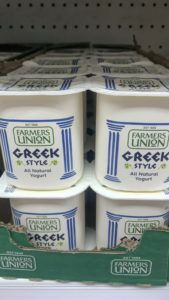 The only plain multipack in my local supermarkets is the Farmers Union Greek (which is still a good option) which are $5 for a 4 pack. I’m really not a fan of the pouches, especially for babies and toddlers but I will put aside my thoughts about them for the purpose of this post! They’re certainly popular so getting our kids to eat more dairy is a good thing. Most pouches freeze well so you can put them in the lunchbox frozen for an icy treat at recess or it will be defrosted but cool by lunch time. Some yoghurts can get a bit watery on defrosting so test one first. 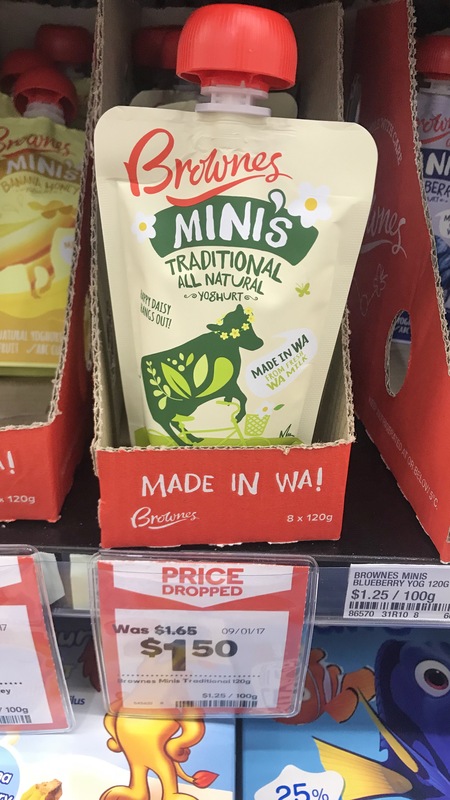 The Brownes Dairy minis are great, made in WA and have no added sugars. They’re 150g which is a little less than a full serve of dairy. 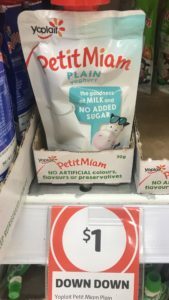 The Petit Miam plain pouch is another plain yoghurt with no added sugar. It’s a smaller serve, 95g which makes it a good option for younger kids who can’t get through a larger pouch. Be careful you don’t accidentally pick up the vanilla which is also in a blue and white packet but does contain added sugar. At only $1 they make a good shopping snack too. 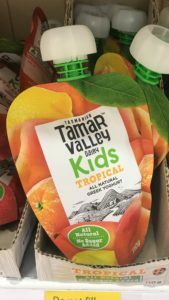 Tamar Valley Kids Pouch is one of the only flavoured yoghurts with no added sugar. 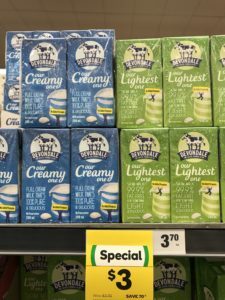 They’re $1.70 for 110g and which is about half a serve of dairy. Look for them when they’re on special, sometimes 5 for $6. Obviously not a yoghurt, but these UHT milks are the perfect lunchbox drink. UHT milk is just as nutritious as fresh milk with the added benefit of being sealed and shelf stable. Put it in the fridge (or freezer) overnight so it’s nice and cool for morning. For those with allegies, Liddells also make a lactose free 200ml tetra pack and Soy Good have 250ml tetra packs of their regular soy milk which is fortified with minerals and vitamins including calcium and B12. 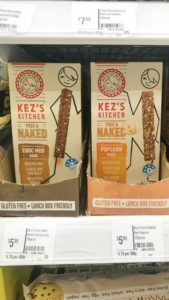 Kez’s Kitchen Free & Naked bar are nut free fruit sticks made from dried fruit and seeds with no added nasties. They’re not cheap but they shouldn’t be eaten every day either. The perfect lunchbox treat. 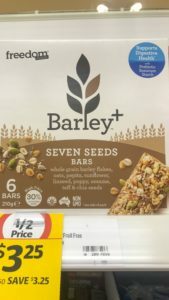 These new Barley Plus muesli bars from Freedom Foods are available at Coles and use a special strain of Barley developed by the CSIRO for maximum nutrition. They’re one of the few low sugar muesli bars with just 7.5g per 100g. They contain a mix of the BARLEYmax grain plus chicory root fibre (an important prebiotic for gut health), seeds and rolled oats. Regular boxes of sultanas are 35g and contain the equivalent of 100 grapes. These mini boxes are 15g, which is a much better serve size, especially for younger kids. Even in these amounts, dried fruit is very sticky and contributes to tooth decay so keep them as an occasional treat. These Macro brands Chia Pots are only available from Woolworths stores in the health food aisles. They contain just water, fruit and chia. The ingredients doesn’t say if its juice or pulp but they don’t have any added sugars. Chia seeds are a good source of fibre and good fats. 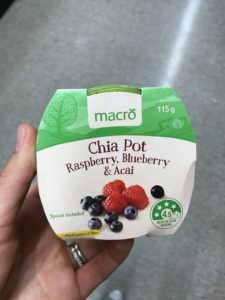 Chia Pod also have a similar product available in Coles and Woolies which also contains coconut milk (remember there is no calcium in coconut milk though) but still no added sugars. Of course, there may be other brands and products that are just as good that I haven’t seen. If you’ve found something great, let me know on facebook or Instagram and I’ll add it to the list with a credit to you! For snack ideas for younger kids, check out my ideas for on the go snacks for toddlers and kids. If you’re up for some quick and easy baking, my mini lunchbox frittatas, magic fruit muffins and savoury muffins always go down a treat!